March 7, 2018 March 7, 2018 / J.K. 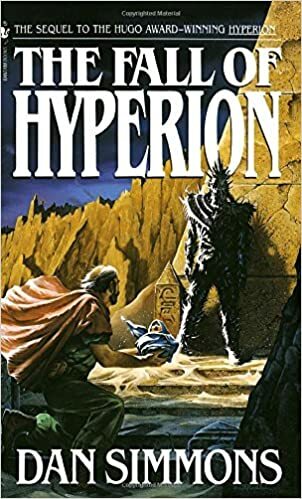 This is the second book in a series, check out my review of the first book – Hyperion. Level – Quick, easy read; fairly long at over 500 pages. This is a continuation of the first book, Hyperion, so the story line of the Pilgrims in continued, but there is also the introduction of another main character story line. To avoid spoilers (if that is a think for a book published over 20 years ago), I’ll say the Pilgrims all meet the Shrike, all have their stories (more or less) meet a resolution, and find out that their stories are even more intertwined than they knew. The additional character is Joseph Severn, a Cybrid for the personality/memory of John Keats. Much of the book takes place from his vantage point. Not only his own story, but he is inexplicably tied to the Pilgrims and view what is happening to them in his dreams. CEO Gladstone puts him up in TC2, so that he can keep her apprised of the Pilgrims. Severn/Keats and the Pilgrims stories also mix together, as does the Ousters, for a few twist and turns you don’t expect coming, including a few new back stories. One quick thought, that I didn’t put together form the first book, but become more apparent in this one, why does the cover art show the Shrike with only two arms? The Pilgrim story conclusions are interesting, though some are unsatisfying, and at Severn is not an interesting character. However, the book touches on some of the wildest ideas of AI and has so many intertwined stories and crazy new back stories, it is well worth the read. I found the first book in a give away section of my local library. Became an instant fan soon after.